Trading Plans That Make Money!" Note: This is not a get rich quick scheme or a 'black box' trading system. There are hundreds of "trading gurus" who want to sell you get-rich-quick products for big bucks. Maybe you've bought a few already. Some of them work - some of these programs are even great. But where almost all of them fail is in painting a picture of how trading works. When you understand EXACTLY what it takes to design an excellent trading system, you'll understand why most people fail to make money trading. The fact is, I can show you how to be successful trading, but it will take work! Let me share with you my step-by-step, blueprint anyone can follow to design profitable, part time trading systems - tailored to your unique situation. 7+ years in development and tested with hundreds of my coaching clients, this blueprint has now been proven to work with forex, stocks, options, futures, cfds, and all other markets. Perfectly suited to the beginner/intermediate looking to trade intraday or longer time frames - this is the complete guide to profitable trading. How to quickly and easily get started trading profitability. 3 critical components all profitable trading systems must have. The secret to mastering your discipline, confidence and psychology. How to best enter and exit your trades. What tools the professional traders use. How to prove your trading systems works, before you trade it. How to maximize your profits and minimize your loses. How to trade part time but make full time profits. In short, you're going to learn how to consistently make more money trading. Even 'Smart Investor', one of Australia's most prestigious trading magazines, did a full page spread on me and my trading methods. If you want to find out more about me, click here to read my full bio or google my name "David Jenyns". If you're so successful trading, why do you give your secrets away? Believe it or not, it's hard to receive letter after letter from people who see themselves as "newbies" - who aren't making a living at their day job, and don't see the possibility of breaking free of the 'rat race' to have the life they want. They simply cannot afford the products they need to change their situation. I only wish someone had given this to me seven years ago when I was getting started - it would have made me more money sooner, and saved a lot of wasted cash, time and frustration. The fact is, I make the majority of the wealth through trading and investment... not through selling ebooks. I don't need your money. After chatting with my team we agreed, the minimum charge we could allow was $7 - this pretty much covers our overheads for the website and support. You'd have to agree that's very fair. Download your copy of the UTS2.0 and learn how to get a significant trading edge over other traders. Only $7. Once you order, I'll immediately email you the download links for this 56 page ebook and I guarantee you'll be thrilled with it. Buy it. Apply it. Profit from it. PS. Do you have any questions? You can email me by clicking here. "I was skeptical when I looked at the title but then I started reading the book and was SPEECHLESS! This thing is FANTASTIC! Despite the fact that I have YEARS of experience trading, I'm now using the Ultimate Trading Systems to design every new trading system! Why? Because it condenses everything you need to know and do into a simple action plan ANYONE can implement. The information, links, tips, and inside tricks are worth GOLD!" "I think it was a great read. It summarizes a lot of things about trading with just 56 pages; other books would have been around 200 pages or more. Because every chapter/section is precise and to the point, I was able to retain most of the vital information. I would definitely recommend this book." Much better than lots of "must-reads". After reading some trading books I think yours is the best that I read so far as it covers lots of areas with clear facts. Why reading ten other books if yours is covering all? Of course as you put such a lot of information in your book it requires full attention when reading." "I've been trading for four years and the combination of UTS 1.0 and TSR1 was the turning point in my trading. I personally think that both the second editions are better. The work is clearly of someone that trade as well and do not only write trading literature. The value of these documents lies in the eye of the beholder that is why only a very small % of the people reading it will reach page 54, and a even smaller % will apply it. One very important lesson I've learned is to physically trade with real money, nothing else can teach you more or show you if you are cut out for this job. No papertrade can teach you about slippage or the mental fitness to win or lose real money. Keep up the good work." I felt the concept was excellent. It covered every aspect required to work up a successful trading system. All critical points were addressed. ie. trading plan, money/risk management, psychology issues, entries and exits, trading software and data providers, back testing and system metrics/performance. I found your writing style easy to read, without being too wordy. You presented all the relevant information in a systematic way and I think most traders with some experience would identify with the realistic expectations of trading which you expressed. Ps. I am really enjoying the OTM. It seems to be working very well, with quality content and active member postings." "David..my name is Murray Marshall and i'm reading your new version of trading systems 2.0. The course has so much common sense and it's such an easy read because you have distilled what would be hundreds of pages into a simple but effective trading guidebook. I wish this were around when i started 15 years and many losses ago. I know i will make all my losses back by using the guidlines presented in your manual which more than anything it "changes the way you think" which is the most important thing. Keep up the good work!" "I have reviewed this Trading Manual by David Jenyns, and I'd like to say, what a great introduction to the world of trading. David lays down the foundation for success. If you follow what he says here in this little gem, you will ultimately become a winner. It will give you an understanding of 'risk' and the ever so important 'money management', which David, in all of his material, excels in. Learn about pulling the trigger. Learn about managing a Trade as it progresses through to being closed out. And to learn about what's required of 'you' to be the success that 'you' want to be. Its simple really....Don't procrastinate.... Grab your copy NOW.... and start the journey." "I just finished reading Ultimate Trading Systems 2.0. I found it a very good tutorial on what a new trader should be doing before starting to trade. It stresses that a person must make plans on how he is going to develop his trading plan prior to trading. The book not only stresses the absolute need for a trading plan, but it shows how to make one. It is an important read." "Thank you for sending me the Ultimate Trading System. It has really helped me focus on my trading. The first thing I did after reading the Ultimate Trading System was to write out my trading system. Something I had never done before. Then I put up four 3X5 cards that I see twice a day. Since doing this my trading has improved. During the month of January I did 20 options trades. 16 profitable and 4 losers. I was typically taking profit around 30% during this testing phase. And guess what the losers were from trades I did not following my trading system. I will be following my plan from now on. I've been searching for a trading system that works for me and all I had to do was write out what works for me and follow it. I know that by following my trading system I will get trading losses. It's just part of the business. But now I have a written plan and system to follow and my trading losses will be small. Once again thank you for putting the time and effort into the Ultimate Trading System." "Just wanted to comment on the book as requested. I find the material to be very usefull for new traders provided they take it to heart. I am a full time trader and have basically learned the lessons in the book after years of trial and error and thousands of $ in courses. Excellent! Through all the chapters, the different subjects are presented in a very simple and understandable way. You have succeeded to make them simple but not simplistic. This way allows this book to be read profitably by newbies but also by more experienced traders. The idea to write those objectives remember me this is a contract a trader makes with himself, thus it's importance. The trading psychology is particularly enlightening. The discipline and the confidence in trading come by learning and praticing until the necessary skills become second nature. For me, this is the most important chapter in your book. All the other chapters give an operational approach about how the trader should design a winning trading system he will feel comfortable with, in accordance with his realistic objectives. In this point of view, the comparison of several trading styles and markets are a great help. A central chapter shows also the importance of having a trading plan with its practical, psychological and evolutionary aspects. There is then a clear description with the elements a trading plan must contain : the perfect entry, the excellent risk management and the perfect exit. These are a must. It is also very useful to address the delicat problems of the choice of the charting software, the data providers and the broker, with clear questions and practical advises." You have compiled a down to earth explanation of vital information. The trading experience can be either supremely rewarding, or utterly debilitating. Strict adherence to the principles discussed in your book will lay a firm foundation for ensuring a trader enjoys the rewards." I really enjoyed reading UTS2.0. My first reaction to it was "56 Pages? ", but once I got started I found that it was really easy reading and very informative. The book has reinforced to me the necessity of having a written trading plan, money management and back testing. I have heard these over and over, but I have never really committed to doing them. As a matter of fact, I have decided that before I make my next trade, I will finish writing my trading plan and stick to it during my trades. They were some things that you mentioned that I find myself doing. For example, following all those emails to see what new strategies they are offering, but as you have mentioned in the book, if I have a written plan, and have back tested my system, then there would be no need for me to go chasing after every email to see if their system is indeed better. An eye opener for me was the fact that successful trading is only 10% of the system. Maybe if I had realized this fact a while ago, I could have saved myself thousands of dollars. I would definitely recommend this book to both beginner and experience traders. It was a good job pulling this information together." "Ultimate Trading Systems kept me glued from beginning to end. Taking a systematic step-by-step approach, this "blueprint" discusses all the aspects of designing and implementing a trading system, and explains clearly the reasons for each decision. I found it a detailed route map to planning to trade profitably. Early on there is an overview of what the reader wants to achieve, so that the type of trading and the financial instruments can be decided. This forces you to stop and think instead of plummeting into failure by trading in the wrong way for you. It also explains why buying an off-the-shelf system may not be a good choice. The chapter on entries puts the topic in perspective, by quoting from Van Tharp. This is a lesson that many traders have still to learn. I like the way snippets of MetaStock code illustrate clearly how to set up a system to screen for potentially profitable trades. UTS covers every aspect of trading, including selecting software and the broker, and emphasizes the importance of back testing to prove the trading system. I particularly like the way that each chapter finishes with actions to be taken, to ensure that the content is understood and implemented. It's useful to have links to additional information which elaborates on the lessons. An easy read but packed with content, this blueprint is one I will refer to again and again. It gives clear direction on every aspect to becoming a successful trader." The best comprehensive informative guide to Trading I have read. A must read for all newbies to trading. Nothing you have said is "new" but you have presented it in a clear concise manner that anyone should understand. I particularly like your constant reinforcement of the system process, discipline and managing emotions - the most difficult challange for all traders. I also like your coaching through the need to develop one's personal trading plan aligned to one's own personality and goals. A great publication I would recommend to all traders - newbies to learn and oldies to reinforce the basics which can so often be lost." "Thank you for this chance to look over 2.0 I was already reviewing my basic methods, so this was just the right time. Presentation is accurate and concise, giving to me at least a feeling that successful trading is achievable. I like the way that links are set out, right where you need them not in some list at the end of the 56 pages. Content. The need for focus and discipline is clear. However you do mention a time scale, 3 months I recall. I do not agree with setting a time to learn to trade as it depends on so many factors: mindset, inteligence, time available, family pressures ...all kinds of stuff. Conclusion. I like David's writing and methodolgy. It has helped a great deal on my path to become a trader. I still have a way to go, hence the need to keep track of the core plan." I believe the UTS 2.0 will definitely be of great assistance to traders, especially someone new to the markets will realise it takes a lot of discipline and hard work to achieve success." "One of the most comprehensive ebooks I have ever read. It covers all of the most important pieces that the newer and not so newer traders should take notice of if they are to succeed in the trading world. Congratulations David, I would certainly recommend this product to anyone who is considering entering a career in trading." "I've completed my first read-thru of the book, I generaly like to treat books like this as textbooks so my study involves several read thru's before application. I think you've made me realise how much time I've wasted trying to perfrect enrty, trying to create my own system as well. Not that my system was useless, but just by playing arround with a few built in system's inmetastock and applying the simple rules in your system I've improved results dramatically compared to the system I'm currently trading. I've not traded any of the system's live yet as I want to complete my study of the book and then spend time back testing and confirming the system I'd like to go forward with. Under money management I think I've also had an "aha" moment; I never had position sizing in place and back testing some of your suggestions has also revealed that there is a lot of merit in considering it for my own system. I'd definitely recommend this book for any who serious about becoming successful at trading. " Keep your good job, David!" "I was favorably impressed with the e-book. The author lays out the correct mindset of what it takes to become a trader and offers excellent, time tested advice about defining your goals, setting up a trading plan, the role psychology and discipline play and much more. Along the way reference is made to good perspective to take from the likes of Dr. Van Tharp, Warren Buffet, and more. "There is one common element amongst all successful traders: they have a systematic way they approach the market. This approach is unique. In reality, no two people have exactly the same amount of money, tolerance for risk, personality, time or experience. Therefore, the key to success is to design a system that is suited for you." This crucial fact alone is worth the price of this e-book. This reality takes time to develop. Again self knowledge is key. One can't gain this information overnight. Practice, patience and discipline are key. The no nonsense, down to earth advice about a realistic path to trading success. No pie in the sky instant riches nonsense here. A well founded trading plan is the key. That plan includes tested and trusted entries and exits... but above all, it includes a strong awareness of money management as the real keys to the kingdom. I have found the advice about money management and psychology to be most helpful. Entries and exits are only a small part of the puzzle. You want to develop a long term, sustainable trading profession. A good money management plan encompasses discipline and patience. This is serious stuff and not gambling. The only way to treat it as such is to stick to time tested MM principles and not waver. This work is a great introduction and overview to the idea of trading. It lays out in clear, responsible detail what it takes to become a successful trader and skips all of the pie in the sky hype. " "A well written book with all relevant information I wish I had known about at the beginning of entering the world of trading. Not too over technical and only at the correct points, this ebook is written in a common sense way which I feel would not belittle anyone or their interlect. It is a well balanced book in approaching all aspects of the subject matter. I would have no hesitation in recommending this ebook to all thinking of or indeed into trading, regardless of their level of experience. Well done David and thank you. " "The Ultimate Trading Systems 2 should be the traders bible or maybe stitched to the traders sleeve. It's well written in easy to understand language. I would recommend it as a must read." This totally blows your previous manual out of the water. I especially liked the ' M & M 's : Mind set & Money management, it's clear, concise & informative, if people treated trading as their business there would be more profitable traders. This manual clearly addresses this problem & I would recommend UTS 2.0 to everyone." The manual is well written, very informative and concise. It gives traders a very good idea of what it takes and what is required to be a professional profitable trader. The manual covers all aspects of trading and highlights the importance of having a good and robust trading plan. The manual is easy to read and can easily be implemented by all traders very quickly. The manual stresses that there are no magic bullets out there and no holy grail, however success can be achieved by following a strict trading plan, with limiting your risk and drawdown to a low acceptable level. This manual is an excellent resource for newer traders and it should give them the fundamentals of trading successfully, without spending thousands of dollars on "sercet trading tactics" which promise to make you rich, however never do. Well done David. This is a great resource." Kudos David, I will recommend it to my traders group once you release it official." "I think you have produced a very useful document outlining the key issues associated with successful trading. Your emphasis on the importance of having the right mindset (namely, removing emotion from trading decisions) and proper money management is spot on. You walk the reader through everything necessary to establish a trading business from trading plan through to software selection, back testing and selecting a broker. The resources and action steps you provide at the end of each chapter are also very useful and motivating. All told, a great document for the beginner and a good refresher for the more experienced." This book is what all experienced traders wish they had at the beginning of their trading careers. It covers all the essential topic's in a general way that should save a lot of time to new traders if they take the information onboard. As a trader and a keen golfer I find many similarities between the two and it helped me enormously in my early trading days to get on top of both golf & trading. Beyond this point every golfer and trader differ in their actions to get the job done as every individual develops their own golf swing and the same applies to trading methods. My point is their is no holy grail that will suit everyone, it is essential to develop your own stile around your personality and abilities, therefore I feel all books should pay a high propriety to this fact early in their content, so clients know they need to access and know themselves at the beginning of their journey, this will start them in the correct direction and simplify the whole process of understanding what is required to be successful." "Hi David, In these days of mega-information overload, it is refreshing and quite delightful to read a compact, concise and very readable "big picture" overview of how to trade the markets and make money. It is relatively easy for anyone ( self included) to know a lot about a small part of the story; without having the overview that your book offers. So, well done and all power to you. I learn a few things from reading your ebook such as setting the exit at LL(x) and the formalizeing the three parts of a trading plan. In my opinion, this ebook is more helpful to experienced traders (good or bad), but less so to the new ones. The developing of a trading system is too short. I wish there would have had more on the technical discussion of the system. The use of helpful and simple indicators are not mentioned. Trading systems for short term vs long term need to be explained a bit more." "I want to compliment you on the easy to read writing style you have adopted throughout the book. In my search for what you describe as the "Holy Grail" I have read a lot of material over the past few years and I consider your efforts to be concise and very much to the point." I found the read very informative. It also made me realise that it is no good wasting time trying out every new method that comes along. I avidly read your e-mails and look forward to receiving more, especially anything relating to this recent book. It was a very good read, easy to understand with lots of useful tips. many thanks for allowing me to read your book and hopefully it will start me on the road to proper trading." "I am very excited about this eBook and I feel that if I had this when I first started trading it would have saved me a lot of time, effort and money trying to figure everything out. What I liked the most is the practical angle that you took in guiding your readers step by step and recommending materials to read and study. Although I did not specifically started to use it, it is already part of my approach but I am using it to sharpen my plan and re-evaluate my process. This will take some time. "I have read UTS 2.0 & it does set out well & simply the guidelines for formulating a trading/investing plan which I am currently doing. Thank you for offering it to me it has been very helpful." "I wish i had this document when i started trading. Well, i most probably would have gone through the whole proses that i did to become what i did in any case, i would not have believed your document in any case. Today after 8 years i do believe your document because i know what i know. Money/risk management and correct analysis of system is critical and cannot be emphasized enough. Henri Coetzer - South Africa. "Brilliant ! I am working through it again because I have made many of the mistakes you warn against. It is the best way of starting trading. The most valuable part to me was to again realise how important the psychology of trading is. I went down the road of the indicators and technicals and got so involved with that part that I became more and more ineffective trading. Not that I was loosing that much but I was missing out of so many trades because I did not follow my trading plan. Always second guessing it. Second major mistake was trading with mental stop rather than predefined stop-loss. I started learning Forex when I stumbled over UTS 1. It has been THE source of information and reference for me ever since. UTS 2 has taken a very good manual 1 step further. It is now more concise and better structured then the first one. I personally love the tasks you give the reader at the end of every chapter. You are definately the one source of information which helped me the most in becoming a Trader." "An excellent blueprint for those new to the game, or for the more experienced yet to achieve success. You are one of a small group of providers who outline an approach that if followed has a high degree of safety. I like the focus on the mind and money management." As usual, a great work!! Vary interesting, well edited; most of it is very simple to understand and the most important thing, it sound very reliable. In contrary to lot of stuff that is offered over the internet, your system, to me, sounds the most trustable and reliable one. As I have told you in the past, I admire you for your charisma and initiative skill. You are always driving yourself one step further and helping others on the way." “Wow! I have read countless trading books and honestly this is the first ever book that really takes me to a level of a professional trader. The step by step instructions are fantastic and I'm absolutely sure that anybody, whether they have been long in this business or newcomers, will raise themselves to a professional level should they follow your clear and concise instructions. "Whenever I receive information from David, I have come to trust it as concise, current and excellent practical information which I can use immediately. David has once again produced an excellent condensed guide in "Ultimate Trading Systems" containing many valuable insights and pointers to becoming a successful trader. Thank you for the Ultimate Trading Systems. I have followed and committed your to your Step-by-Step Instructions. It taught me true money management and more importantly it taught me how to use stop loss orders to minimize losses. 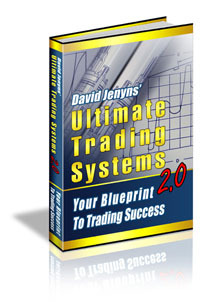 "The Ultimate Trading System by David is truly the most comprehensive and practical course available in the market, covering all the key winning aspects to the development of a sound and robust trading system. The entire package is simply awesome! How I wish I had this course when I first started in the world of trading. Thanks for sharing so much vital information in your indispensable and highly recommended course. Thanks again, David!" I’ve finished reading Ultimate Trading System and I’m impressed by it. It is a must-have manual for anyone who wants to become a successful trader, but does not know the way. Each lesson is an easy read and comes with specific action steps that, when followed faithfully, will lead a complete novice to the path of becoming a professional trader. After reading your 'Ultimate Trading Systems' ebook, I found that it tells the truth in trading. Simply the best book I ever read about trading the market! Thanks! "Excellent! All successful traders say you need to develop your own trading system based on your own personality ... but there are very few books on the market that show you how to actually do this. Finally here is an easy to follow, step-by-step process that will allow anyone to develop their own successful system." "The methodology in the "Ultimate Trading Systems" book is excellent and well presented. You direct readers to other experts for specifics, an approach which saves the novice traders huge amounts of time and keeps them on the safe and proper track. New traders especially will benefit from this." "As a new share trader the 'Ultimate Trading Systems' will assist me in my future trading. At this stage of my growth it provides many details which fill my knowledge gaps." "I found it very informative and easy to read. Even though I have my own trading plan which I've used with success I'm always looking for ways to improve it. At this stage I'm generally pretty happy with my plan but I'll no doubt incorporate aspects of your plan into mine after I've re-read it a few times." Absolutely wonderful - NO! I mean... Your manual ROCKS ! You've simply put together a jamb-packed, informative, step-by-step approach to trading! :o) You've done it so well in fact, that it's like you made what was once a narrow and crooked path of learning into a "6 - Lane Express Highway" leading to a canyon filled with GOLD!! You've simply got the ability to guide your readers through an amazingly clear and uncluttered learning curve of what it takes to grasp the fundamentals of trading successfully! You've by-passed all the so-called experts, cut out the misinformation, taken out the clutter and used your own "in the trenches" experience to develop an amazing 11-step plan to become a successful trader. To some people, this may seem so few steps . . . but you've presented it in such a way that there is no other alternative to learn unless people want to do it the hard way! Instead - I'm all for your awesome tool to successful trading! Thanks so much David! I hope you continue to use your remarkable ability of training individuals to trade in an entirely successful way!" Who wouldn't want results like these?! Download your copy of the UTS2.0 now. Only $7. Disclaimer - Forex, futures, stock, and options trading is not appropriate for everyone. There is a substantial risk of loss associated with trading these markets. Losses can and will occur. No system or methodology has ever been developed that can guarantee profits or ensure freedom from losses. No representation or implication is being made that using the Trading Secrests Revealed methodology or system or the information in this letter will generate profits or ensure freedom from losses. MetaStock Trial | Find a Forex Broker in Australia. For the latest trading strategy updates, visit forexindicator.com. Copyright 2007-2009 Trading Secrets Revealed. All Rights Reserved.